Headbands are an essential tool in the arsenal of every natural. They can make the worst hair days manageable. They can make your puff pop and they keep your hair out of your face while performing any activity. Everyone has probably used one, from young kids to mature adults, girls and even guys too. Although they are handy for everyday wear, they can also be used to effortlessly transform your look from day to night. Headbands come in all kinds of shapes, sizes and materials. When it comes time to dress up for a night out, try swapping your regular headband for one with a bit more style. 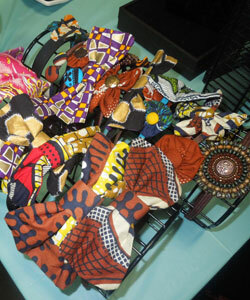 Personally, I love stretchy headbands because they are comfortable and come in many colors to accentuate any outfit. The plastic molded headbands also offer great ways to step up your style. The good thing about plastic headbands is that they tend to hold their shape well. You can try the Comfort Flex brand by Goody if you are looking for a good plastic headband. If you want to go bold, try adding a headband with a bright pop of color. Flowers, jewels and feathers are just a few of the accents that make an ordinary headband into just the right touch for dressing up your look. Even simple touches like satin bows and sequins can be just what you need to transition your daytime look into one perfect for a night out. Whether you plan on wearing your hair up or down, a stylish headband is always a great accessory to add! For an even more fashion forward approach to rocking your headband, try switching up the placement. You can turn a headband that has an accent piece like a flower and wear it towards your ear or the crown of your head. Wearing your headband across the forehead is a great way to jazz up your style for a night out on the town. The Jewels by Anike line has some awesome new pieces that are right on time for the spring season. These handcrafted accessories are not only unique, but they are sure to turn heads in any setting. It’s amazing what a little piece of plastic or elastic can do to transform your look! Something as simple as a headband can make a big difference when you’re going out. Here’s a quick note to those who love the elastic headbands as much as I do. They do have a tendency to get stretched out with frequent use, but don’t throw them away! Thanks to one of my favorite YouTube gurus, Naptural85, I now use those to create even more styles! I can double band a stretched headband to highlight different sections of my hair. This is especially handy when I want to add height to a pompadour. Happy styling! Do you have a favorite headband that you use to dress up your look?